Magnificent detached chalet in own grounds. 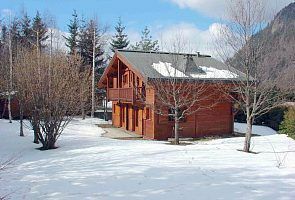 The property is situated 300m from the ski lift at Les Bossons, 1.5 miles from Chamonix central. Features include newly built sauna in own timber framed cabin in garden, garage parking and also outdoor private parking, secluded gardens with awesome views of Mont Blanc towering above, UK sky TV and free high speed internet access, wireless internet and PC. Upstairs are 4 double bedrooms, one with mezzanine above for children, 2 upstairs bathrooms with bath/shower and WCs, also 2 downstairs WCs. 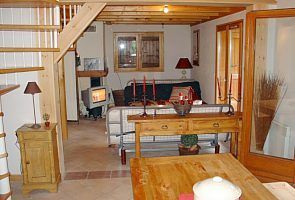 The property was newly constructed 10 years ago, has an open fireplace, under floor heating as well as central heating. The property is self-catering and is managed by a local French family who ensure smooth check-in check-out. Clean bedclothes are provided. Check-in is after three pm on Saturdays with check-outs before midday on Saturdays. The 'Chamonix' centre bus stop is within 1 minute's walk from the property. Self-Catered Ski Chalet Eskimo, ideal for 10, offers sauna, garage, outdoor private parking, secluded gardens, awesome views of Mont Blanc and many more. Read more below and start planning you next ski holiday today.